Arash Nassouri is the Managing Director of NN&SS LIMITED. 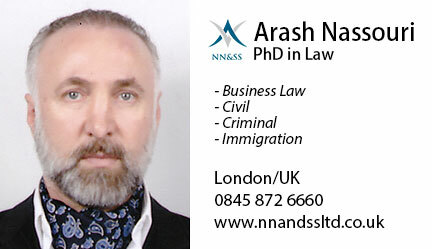 He has a wide range of expertise to include Immigration law, Family Law, Employment Law, Corporate Law and Criminal law. Arash is a charismatic, inspiring, warm and approachable Iranian/British businessman who demonstrates dedication, focus and commitment to achieve all obstacles and is able to meet tight deadlines on every goal he sets for himself whilst being attentive to the small details. Arash also recognises the importance of his Iranian heritage and is an active member within his Iranian community. Arash believes in providing service to the community and is a part of various organisations.